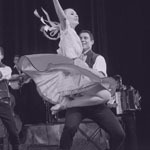 The Duquesne University Tamburitzans are the longest-running multicultural song and dance company in the United States. Headquartered in Pittsburgh, Pennsylvania, the company’s members are full-time Duquesne University students who receive scholarships for their activities. The Tamburitzans mission is twofold: first, to provide deserving students an education; second, to perpetuate the varying folk cultures and traditions of Eastern Europe.